Our seventh major open conference event starts at 2.00pm on Friday 29th March 2019 (registration from 1.30pm), at the Atrium, Distillery Building. Distillery Building. The event qualifies for under the Bar Council and Law Society CPD schemes. The Codex is a unique compendium of Irish Construction Law. Access to the Members’ Section and the CBA Codex is a reserved benefit of membership of the CBA. Members who are not yet registered for online access should follow the registration process set out at the bottom of this page. The Executive Committee of the CBA welcomes membership applications or renewals for the Legal Year 2018/2019 (please see below application forms or for more information or if you have any queries please contact the Secretary). Membership fees for 2018/2019 are now due (as and from 1 September 2018). 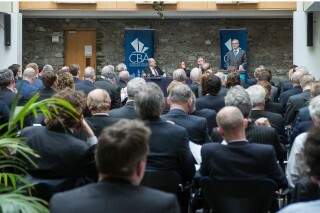 Extant members of the Association may renew their membership by returning a completed application form with the appropriate fee to The Construction Bar Association of Ireland, The Law Library Distillery Building, 145-151 Church Street, Dublin 7.